Powerful and fast-flying (speeds up to 69 miles per hour), the Peregrine Falcon hunts medium-sized birds, dropping down on them from high above in a spectacular stoop. Virtually exterminated from eastern North America due to pesticide poisoning (DDT) in the mid-twentieth century, it was declared an Endangered Species (one of the first placed on the U.S. Rare and Endangered Species List). Extensive efforts were made to reestablish birds in the east in some of their breeding locations, beginning at the Cornell Lab of Ornithology in 1970, which eventually developed the Peregrine Fund. The species recovered enough to be removed from the Endangered Species List in 1999 and restoration efforts have made it a regular, if still uncommon sight in many large cities. It remains a qualified success story. The name “peregrine” means wanderer, and the Peregrine Falcon has one of the longest migrations of any North American bird. Tundra-nesting falcons, they winter in South America, and may move 15,000 miles in a year. 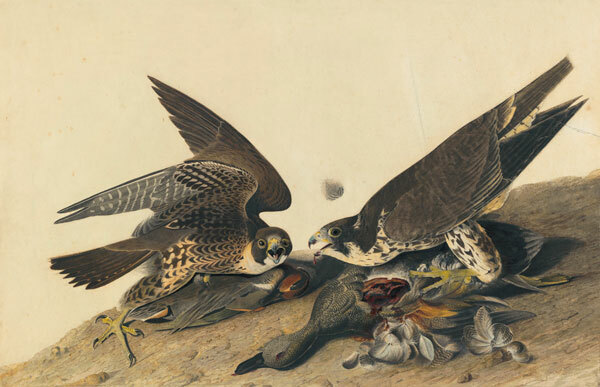 People have trained falcons for hunting for over a thousand years, and the Peregrine Falcon was always one of the most prized of these birds. In his journal, Audubon notes that the female (“a very Old Bird and a beautiful one”) on the right was collected on Christmas Day 1820, during his journey down the Mississippi. He drew it in pastel in the next two days. Some years afterward he cutout the original drawings, pasted it on a large sheet of paper, and, in watercolor, added the male (one of which he collected near Niagara Falls in 1824) and their prey, a Green-winged Teal and a Gadwall. Audubon’s tour-de –force foreshortening of the fiercely posed left bird’s head is matched by that of delicate feather poised, wafting in the air, at the right. The birds’ postures recall the species; habit of diving or stooping upon its prey from high in the air plummeting at speeds that can approach 200 miles per hour, making it one of the fastest birds on earth.